One of the most important things we do in fantasy football is evaluate situation. Whether a player is his team’s No. 1 or No. 4 option matters. Whether a receiver has Patrick Mahomes or Blake Bortles throwing to him matters. You know all this, of course. But as we start looking at keeper and dynasty leagues, one of the things to keep in mind is situations where that player’s place in the world might be changing. To that end, Friday I took a look at next offseason’s free agent class at quarterback and running back. Today, it’s wide receivers and tight ends. This might be information to stash away, or it might make a difference in your dynasty planning. Either way, these are guys who are heading into free agency next offseason. Feel free to debate whether Boyd is actually “top tier” after just one big year, but it made more sense to pair him with Green for the purposes here. Green has been the obvious star for longer, but he’ll be 32 at the start of the 2020 season and has missed significant chunks of two of the last three seasons (6 games in 2016, 7 in 2018). Boyd, meanwhile, was just a guy for his first two seasons, but put it together in 2018 to the tune of 1,028 yards and 7 touchdowns. And he’ll just be 26 when the 2020 season starts. A lot here depends on how 2019 goes. 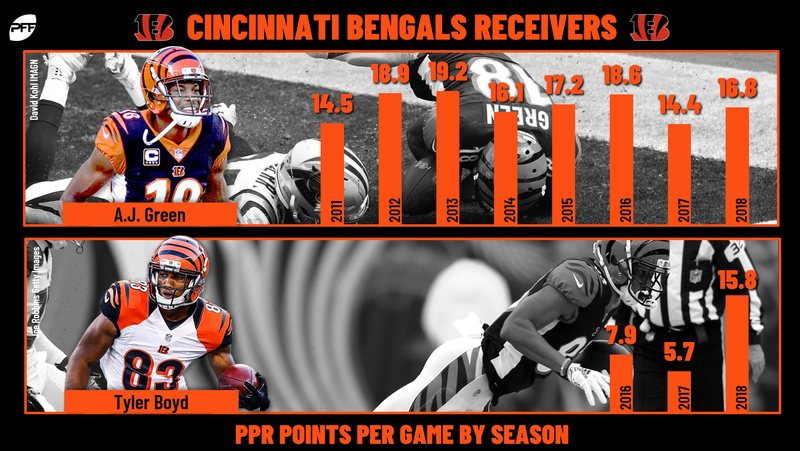 If Green can stay healthy and productive, it’s hard to see the Bengals letting him go. If he continues to see his brittleness increase, though, maybe they turn the reins over to the younger Boyd. Best guess from here is that one of these two guys is with Cincinnati in 2020 and one is elsewhere. And the most interesting part of that is that whichever player leaves will probably have the higher dynasty stock. Andy Dalton has been a perfectly adequate quarterback over his career, but that’s about all he is. If you told me there’s a chance A.J. Green could be catching passes a year from now from, say, Andrew Luck or Sam Darnold or Kyler Murray, that would interest me. Cooper was very good in his first two seasons, then struggled in 2017 and to start 2018, and it looked like he’d hit free agency as a somewhat disappointing former first-rounder. Then he got traded to the Cowboys, had 725 yards over nine games, and suddenly he’s a soon-to-be 25-year-old who is anchoring a playoff contender’s receiving corps. Based on that and general comments from Jerry Jones, it seems unlikely Cooper will ever see the open market next year. Expect a Dak Prescott-to-Cooper connection for several more years. If Thomas hits the open market after 2020 (barring some serious extenuating circumstances), you can have my car. He’s not leaving New Orleans without a court order. I mean, can you imagine him on another team? I can’t. Even if I might like it. A couple weeks ago, he’d be in the Michael Thomas “not going anywhere” category, but we now have questions. I don’t know exactly what the questions mean right now, and neither do you. Let’s just say that if there’s any chance Hill isn’t a Chief in 2020, it will hurt his stock. Edelman’s another player who seems unlikely to ever play for another team … except that he’s the type of player Bill Belichick likes to sell on a year before. It wouldn’t take a huge stretch to see them Patriots let Edelman walk next season and start over at the position with a younger name. And if that happens, Edelman’s stock falls. He’s definitely a player to get what you can for now. If you told me unquestionably that Fuller would stay healthy in 2019, I might argue for him in the top tier section. But we can’t know that about a player who has only made it on the field for 31 of a possible 48 career games. When he’s been on the field (particularly when he’s been paired with Deshaun Watson), Fuller’s been great. If he hits the open market and leaves Houston for somewhere he can be the No. 1, I’ll be nervous. Sanders is a case similar to Fuller in some ways. Six months ago, he was a 31-year-old having a borderline-WR1 season free from the target-hogging ways of Demaryius Thomas. Now, he’s a 32-year-old recovering from a torn Achilles with Joe Flacco as his quarterback. We’ll have to see what Sanders has when he makes it back onto the field, but assuming he leaves Denver for greener pastures, it will have to help his stock. If Gronkowski in 2019 is Gronkowski of 2017, this will be a legendary tight end contract. If Gronkowski in 2019 is Gronkowski of 2018, it will be a prove-it sort of deal. If Gronkowski in 2020 is retired, this is all moot. And the fact that it sounds like Gronkowski is determined to stay a Patriot or hang ‘em up likely makes it even more moot. Remember like two years ago, when the Colts had a dominant tight end duo of … Coby Fleener and Dwayne Allen? The Colts have become a tight end machine under Andrew Luck, taking Doyle from undrafted free agent and Ebron from first-round mega-bust and getting both to the Pro Bowl. But the team also hasn’t shied away from letting tight ends go. The dangers that Doyle doesn’t get healthy and/or Ebron can’t repeat his career year combined with the chances they play pretty much anywhere else in 2019 mean that these guys are good ones to sell if you can get value. Since entering the league, Henry is seventh among tight ends in yards per target (9.9) and fifth in yards per route run (2.00), with a third-best PFF TE grade of 90.7. He missed all of the 2018 regular season to an ACL tear, but returned for the playoffs and should be good to go for 2019. Is stock is obviously going to be heavily influenced by how much he can show in the coming season, but if he produces well, there’s not many quarterbacks who know how to utilize a pass-catching tight end better than Philip Rivers. 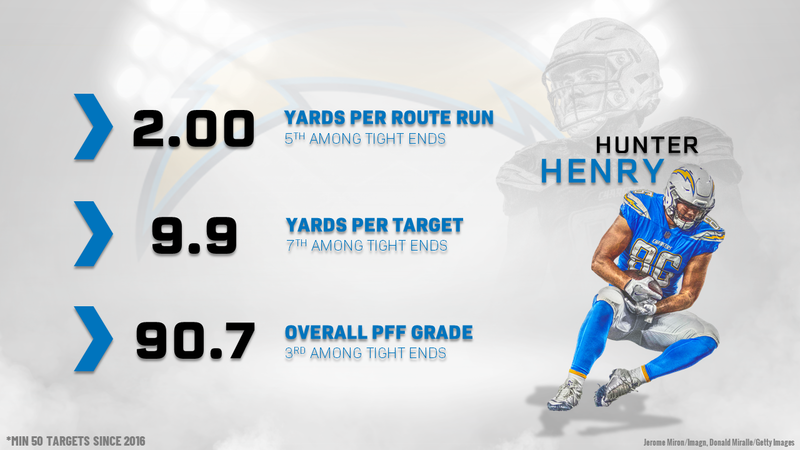 A productive Henry will be a highly valued Henry, although at the same time, it’s hard to imagine the Chargers letting him go, so expect him to be a Charger if he’s good. Rudolph had a huge target share in 2016, and then he saw his touchdown percentage spike in 2017 even as his targets fell off. In 2018, his targets stayed low, but the touchdown percentage dropped too, down to a career-low 5.3%. Adam Thielen and Stefon Diggs being in Minnesota are keeping Rudolph in check. This is about his floor right now as long as he’s a team’s primary tight end. If he ends up somewhere a year from now where he can get a bigger target share, his stock could rise back.